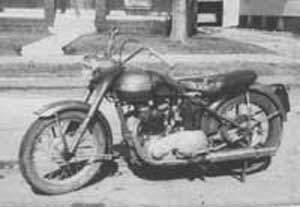 In late March or early April 1961 I attempted my first motorcycle trip across this great country, from Moberly, MO to Sacramento, CA. Weather problems, lack of experience and breakdowns took five days to Weatherford, OK. From there to Tucumcari, NM one day; my best day of the trip. I arrived in Tucumcari late in the afternoon in summer like weather. Ninety-four degrees. I took a room for the night and awoke the next morning to eighteen degrees and snow. After breakfast I stood by a stove in an old gas station waiting for the day to warm up. It didn’t. In spite of my chattering teeth I couldn’t shake the memory of the near 100-degree temperature of the previous afternoon. I hated to leave the warmth of the fire but by mid-morning I decided I had better get rolling. It was still snowing and the bike seemed to run better than ever. It was twenty miles to the next place to stop. My face, hands and legs ached with pain from the cold. I spent half an hour standing by a potbelly stove. Then back out again, another forty miles to Santa Rosa. The cold didn’t seem so bad now. I grabbed a quick lunch, gassed up and headed out again, 59 miles to Clines Corners, 114 to Albuquerque. I could make Albuquerque by nightfall. The temperature by this time had warmed to near 32 degrees. Then, three miles out I hit a heavy, wet snowstorm. I ran the next 30 miles or so at 35-40 mph, with one hand on the throttle and the other scraping ice and snow off my goggles. The tires of passing cars pounded the snow to slush and plastered me with the spray. Finally I spotted a place to pull in. It was an old restaurant with some cabins out back. Covered with snow and ice from my knees down and my waist up, I stumbled inside and sat down. The dining room was furnished with old-fashioned wooden tables and chairs. The floor was well-worn hard wood. Two men greeted me. I looked around the room and didn’t see anyone else. I was barely able to speak the word, “California,” through my chattering teeth. I couldn’t raise the cup from the table without spilling it, so I leaned forward, tilting it just enough to slurp down some of the welcome refreshment. The men stood quietly watching. By the time I had downed two or three cupfuls, I had stopped shivering. The snow and ice on my clothes was becoming a large pool on the floor. The older man started mopping up. “You just relax and drink your coffee son, I’ll take care of it,” he said softly. I really felt bad about the mess, but decided to say no more. A car pulled in. We all looked around to see who it might be. It was a Highway Patrolman. The men greeted him by name; he smiled and greeted them. “What are you doing out in this weather? Where are you going?” he asked. They grinned and shook their heads. The patrolman said, “Well, I think anybody trying to ride a motorcycle in this weather must be crazy.” The others nodded in agreement. By this time I was warm and dry, but it was almost sundown so I asked about eating and renting a room for the night. “How far is it to the next place to stop?” I asked. So back out I went into the snow and gathering darkness.